Izaak Walton wrote the Compleat Angler years ago. He couldn’t know but he wrote it way too early because he never read the blog, Connecticut Fly Angler. I hope you already follow Rowan Lytle at his blog, Connecticut Fly Angler, but if you haven’t yet, you are in for a treat. I highly suggest following it and checking out the archives. He is a consummate angler who cares about just about every fish that can bite a fly. And he’s caught many of them, too. Let’s get the simple stuff out of the way: Who are ya, where did ya grow up, what do you do, and where do you fish? I was born in Western Pennsylvania and my family moved to Central Connecticut when I was 8. I started really fishing when I was 12. I started fly fishing shortly after I turned 14. By that time I was already fishing pretty much whenever I could, and it became the thing that defined me. I became obsessed with every aspect of it. Tying flies, building rods, casting, entomology, ichthyology, fluvial geo-morphology…if it pertained to fish and how they could be caught, I wanted to learn it. Now I’m 21 and with no plans of slowing down…the fish bum life has taken hold. I tie flies, fish, guide a little, write, and work to support my fishing. I fish the most in CT, of course. I’ll fish just about any piece of water here, and there really isn’t much in a 15-mile radius of my home that I haven’t fished, even little drainage ditch creeks and shallow farm ponds. Rhode Island’s shoreline has become almost a home away from home, and I’m there quite often too. I’ve been lucky enough to fish all over though. Maine’s Rangeley Region, the coast from Kittery to Rockland, Gloucester, Cape Cod, New Hampshire’s White Mountains, Vermont’s Green Mountains and Champlain, the Catskills, Pennsylvania’s limestone streams, Kentucky’s Green River, New Jersey, Maryland, Florida…I’ve covered some ground. A lot of it in sweaty and smelly cramped cars and vans, sleeping whenever necessary wherever we could. My next trip will take me to Montana, which has been a long time coming. I found you going down a rabbit hole of fly fishing blogs linking one to another. What was the inspiration for the blog? Honestly, I was just trying to find an easy way to keep track of my own fishing. Even early on, I’m sure I hoped others could gain something from it, but for a while, I didn’t really have a solid direction. I liked what guys like Alan Petrucci (Small Stream Reflections) and Mark Whitman (Fishing Small Streams) were doing stylistically and at times followed their lead, and at other time did more report-like stuff, like Steve Culton (Current Seams) and Ben Bilello (Atlantic Salmon Flies). I think it took a little while for me to settle into my own style. Frankly I’m not sure what that is still, but I try to have a voice, and people seem to like it. Something I am completely enamored by your nearly-daily post rate. How do you do that! Do you have a pocket universe in which to disappear and fish and then write about it and then come back and fish some more in the real world? Ha ha ha ha! Well, I have way too much time on my hands. I’m not in school right now, I’m not in a relationship, don’t have kids, I work when the work comes to me and fish, do photography, and write whenever I get the chance. It’s the fish bum life. It isn’t particularly sustainable, and it shouldn’t be. Believe it or not when I was in school, I fished and wrote more! I don’t know how I had the energy. But, I do know I’m more driven than most, and that’s important. If you have just an hour or two in the day, find the closest stream, pond, or jetty and just fish. That’s how we best learn and improve. That’s what I’m about to do right now…I’ll answer the rest of these questions after I catch a few. Fly fishermen can often get in a rut and really only think of one species as most important. I was guilty of that when I first started learning to fly fish. Trout was king, and it took a day back at an old pond with my Dad to remind me that ‘gills are amazing too. Why do you think we get sucked into this one-track-mind/single-species perspective? A lot of fly fisherman got into the sport because of the A River Runs Through It type image of a well-dressed fisherman standing in a crystal-clear mountain stream casting a dry fly. Marketing tends to throw that image at us pretty consistently, too. Almost equally as romanticized is the image of an angler up on the bow of a skiff casting to tailing bonefish on a pristine sand flat. How often do we see stunning shots of a lush, green, aquatic plant filled Mississippi River backwater, with the sun setting behind a stand of dead trees in the background and a fly fisherman in the foreground holding up a massive bowfin, with its belly and fins painted in textbook spawning time emerald green, on the front cover of our favorite publication? Not enough. I can hardly blame people for targeting one species their whole fishing career, one can learn a lot by doing so. But, looking down on other species because they perceive them as ugly, or believe they eat all the “real” game fish, or just because they are capable of surviving in dirty water, that doesn’t sit well with me. A lot of that just gets passed down. It’s cultural. We say sea robins are ugly not because they are ugly but because we were told that they are by virtually everyone who ever caught one. Anybody that follows your blog knows you seem to blast past that notion by a country mile. What is your favorite fish to chase that isn’t a trout (or a striper)? And, why? Right now, probably bowfin, Amia calva. That will probably change, it always does. My answer would have been common carp just eight months ago. Every species has a personality, and right now, I’m ate up by Bowfin. They look and act like a dinosaur. Most of the time they could care less that you are there. They’ll spook if I’m too intrusive, but I can get right on top of one without scaring it off. Some will just annihilate a fly as soon as it hits the water. Others take more coaxing, but I know they’ll commit once that long, tail-connected dorsal starts undulating like a wave. Still others will sit motionless for minutes while I twitch the fly in their face, just waiting for the right moment before WHAM! They inhale the fly violently with seemingly no trigger. And they all fight like a truck, mostly at close range. It’s not uncommon to land one and still feel like you lost the fight, even with a 10-wt. rod and 15 lb. tippet. They’re a sassy fish. I love it. That sounds pretty dang good to me. Maybe this is the same, but is there a fish species you think is just underrated or taken for granted by the angling community? I could probably list 50, so instead of a single species I’ll list a family. Native sunfish. [Author’s note: I absolutely love panfish, too.] Many anglers don’t realize what sunfish species are native to their areas or how to distinguish between species or hybrids. They’ve got brook trout beauty, even more variation, and they live everywhere. They are easy to catch at times and hard at others. In the Mid Atlantic, there are a few locally endangered native sunfish so beautiful that they are actually more at risk from aquarium enthusiasts than anglers because they are so beautiful. Anglers will frequently wax poetic about a four-inch wild brookie, and for good reason. 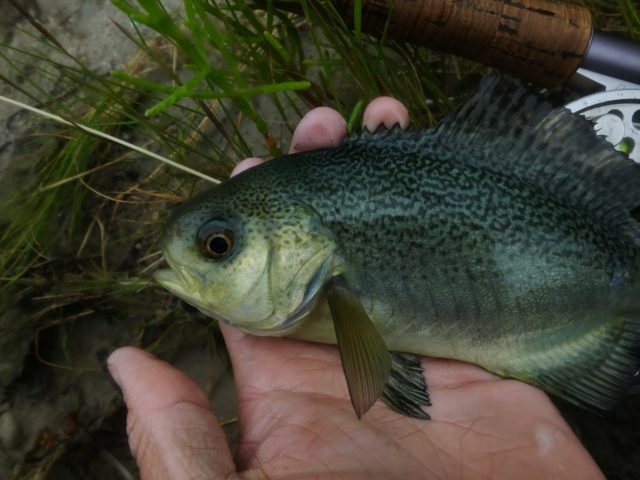 Why not do the same for banded sunfish or long-ear sunfish? People who have followed you will know that you may have the honor of being the first to catch a species on the fly. That is super cool (sorry while I fawn like a band groupie). What fish was it and can you tell us about that day? Well, on July 22, 2018, I got insanely lucky. My good friend and fellow life-lister Noah and I were hitting spots in Massachusetts and Rhode Island on our way home from a trip to Maine. One of our stops was a breachway in South County, Rhode Island. The weather is very important to note. We were about 10 hours into a pretty serious on-shore blow, out of the southeast. The surf was very high, the wind was blowing steady at 15 to 20, and there were significantly stronger gusts. This is the kind of weather that blows stuff inshore from miles out. We happened to be fishing this spot on the flood tide. As we were kayaking up the breachway, I spotted this odd fish tailing at the surface in the lee of a weed-covered rock. I knew it was something odd and that I absolutely had to catch it. After a bunch of missed takes and the fish actually leaving for a brief spell, I hooked it. Noah had already identified it as a juvenile barrel fish. There are some of instances of anglers catching these fish inshore, but it had never been documented on the fly. It wouldn’t be that hard for someone carrying light fly rods and small flies every offshore trip because these fish love to hang out in schools under floating debris. That’s how they got their name. Fishermen offshore would pick up discarded barrels, and they’d be full of these funny little fish. But, not many people do that kind of thing. There are a few fisherman that do this kind of stuff and contacting them gave me much more confidence that I was the only one to catch this species on fly. Martin Arostegui and his son, Martini, and Jeff Currier have exceptional fly-rod life-lists. I discussed the catch with Dr. Arostegui, who had never heard of a barrel fish, and my friend Mark asked Jeff Currier about it. Anecdotal and stupid lucky though it may be, I am almost certainly the only person to have caught and photographed Hyperoglyphe perciformis on the fly. I was so proud I put it on a t-shirt. The famous barrel fish. Rowan took this pic and details its landing on the fly here. Any other life-listers that stand out to you? Blue-spotted sunfish. That’s another that I could be the first to catch on fly. They are tough to get on artificials at all, but given their accessibility and the fact that most fisherman release sunfish without taking a photo or thinking about species identification, I’m just not willing to make that call. I caught it in a ditch feeding a retention pond in New York. It was a gorgeous fish, strikingly dark with bright blue-green glitter-like spots. Regretfully, I wasn’t able to take a picture of it. It’s one of a small handful of species on my life-list I don’t have a photo of. And, because I am a bit of a gearhead, is there any gear that has stood above the rest as you have fought all these different fish? Any tips or tricks to help other anglers find and catch a couple more life-list fish? I am really starting to warm up to Airflo lines. So far, their Ridge Striper floating line is one of the most durable lines I have fished with so far and I love how it shoots. I love my St. Croix Avid 6’6″ three-wt. for targeting micro-fish. That may sound heavy duty for two-inch fish, but I like a little length and enough backbone to catch a bigger fish if they present themselves as a target. I’ve caught 18-pound carp on that stick! You have such varied interests, what conservation organizations or events would you want other people to know about? A new organization, Native Fish Coalition, is doing some great things, and I love that they aren’t trout-centric. I’ve done work for Connecticut River Conservancy, and that is an excellent organization. I think every angler should be following Fissues, and if you care about public land and water, consider joining a local land trust group. If we’re complacent, we stand to lose a whole lot. Any last thoughts that you want to share? Get out there. Explore. Try to do things are completely new to you every time you fish. Thanks so much for sharing your time with me. Where can people find you? I can be found on my blog, Connecticut Fly Angler, and on Instagram as @r.m.lytle. I tie custom flies and guide occasionally on request. I can be contacted at brwntroutangler@gmail.com. Rowan Lytle is still ticking off life list species; see some great pics here. And if that doesn’t make you feel bad yet, he also ties flies for Dette Fly Shop in New York. Thank you for your post! There is a true light shining for the younger generation . He’s doing good stuff for sure! I follow RM’s blog site and believe him to be one of the best fly fishermen in our region. I agree. He has amazing drive and skills. Nice post Joe! So cool that you got to interview Rowan. I’ve enjoyed reading his blog since before I started contributing to this blog. He truly is the best fisherman our age and I’ve certainly learned a lot from reading his posts. Thanks Ashu! I have also learned a lot from reading his blog. And expect to keep learning a bunch! Great read Joe – and Rowan. I’ve loved Rowan’s blog for several years now. If you are new to it, do yourself a favor, poor a coffee, find post 1, and just enjoy reading forward. Amazing tales of fishing. It’s awesome! Thanks Will. But your gonna need more than one coffee to get through all those good reads!